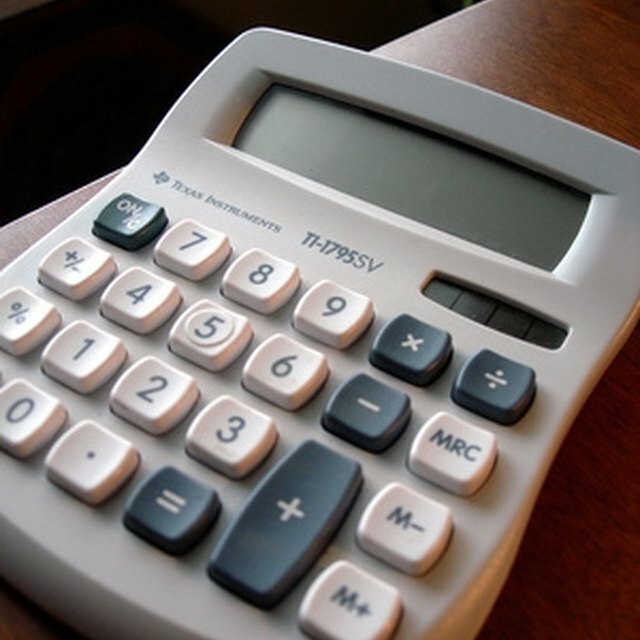 By default, scientific calculators, like regular ones, display fractions as decimals. So if you enter a simple fraction, such as 1/2, the display reads 0.5. Some – but not all – scientific calculators offer a feature that allows you to display fractions without making the conversion. Using this feature, you can enter a complex fraction and simplify it right on your calculator. Calculators with this feature also allow you to enter a number composed of an integer and a fraction, such as 1 1/4. If your calculator doesn't have this feature, you can use a workaround to manipulate fractions. Calculators that display fractions sometimes have a special mode, called Math mode, that you must first select before you can enter fractions. When the calculator is in Math mode, the word "math" appears at the top of the screen. Once you have selected this mode (if necessary), look for a button with two boxes, one black and one white, arranged on top of each other with a horizontal line between them. This is the fraction button. On some models, the button may show x/y or a b/c. Pressing this button enables the fraction feature. Calculators with the ability to display fractions have a special fraction key. Press this before entering the numerator and denominator of the fraction you want to enter. When you press the fraction button, a fraction template appears in the display. It sometimes consists of two blank boxes arranged one over the other and separated by a horizontal line. The cursor will appear in the top box. You can now enter the numerator of the fraction. On some models, fractions appear as numbers separated by an inverted "L." This character represents the horizontal line that separates the numerator and denominator. Press the cursor down key (the key with the arrow that points downward) to move the cursor from the top box in the display to the bottom if you calculator has number boxes. You can now enter the denominator. If you need to change the numerator, you can always return to the top box by pressing the cursor up key. If you have the type of calculator that shows fractions in a single line, simply enter the denominator. There's no need to move the cursor. If you want to enter a number such as 1 1/4, press the shift key before pressing the fraction key. The display will show a third box to the left of the two fraction boxes, and the cursor will be in that box. Enter the integer part of the number, then press the cursor right key to move the cursor to the numerator box of the fraction. On calculators with linear displays, enter the three numbers in this order: integer, numerator, denominator. Although you can't display non-decimal fractions on a calculator without a fraction function, you can still enter them. First enter the numerator of the fraction, then press the division key and enter the denominator. Hit the "equals" key and the fraction will display as a decimal. You can't convert a decimal to a fraction on the calculator, but the calculator can help you do it with a pencil and paper. Suppose you want to express 0.7143 as a fraction. You could write it as 7143/10,000, but maybe you want to reduce this to something a lot more simple, such as a denominator that's a single digit. To do this, enter the original number as decimal, and then multiply by the desired denominator. This gives you the numerator of the fraction. For example, if you want a fraction with 7 in the denominator, multiply 0.7143 by 7. The calculator will display the numerator, which in this case is 5.0001, which is close enough to 5 to be equal. You can then write the fraction 5/7 on a piece of paper. Deziel, Chris. "How to Make a Fraction on a Scientific Calculator." Sciencing, https://sciencing.com/make-fraction-scientific-calculator-5843488.html. 25 April 2018.